for sadness has a refining influence. Writers block is a real thing, friends. I have had so many nuggets I've been wanting to share, only to leave my keyboard in tears, frustrated, because I felt like God keeps telling me "not yet". You see, there are pieces of my heart I want to share, but it's not necessarily the right timing. It seems like my life is a constant battle of my desires hitting me hardest at the wrong time. 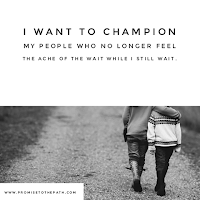 As we approach the 4 year mark of trying to conceive, I realize the intensity of the desire isn't lining up with the fulfillment of God's promise. Do I believe we will conceive? Yes. God has given us enough promise along this journey to build my tank of hope up. I waver and doubt and worry, but in my heart, I know I can stand in faith that God will come through. 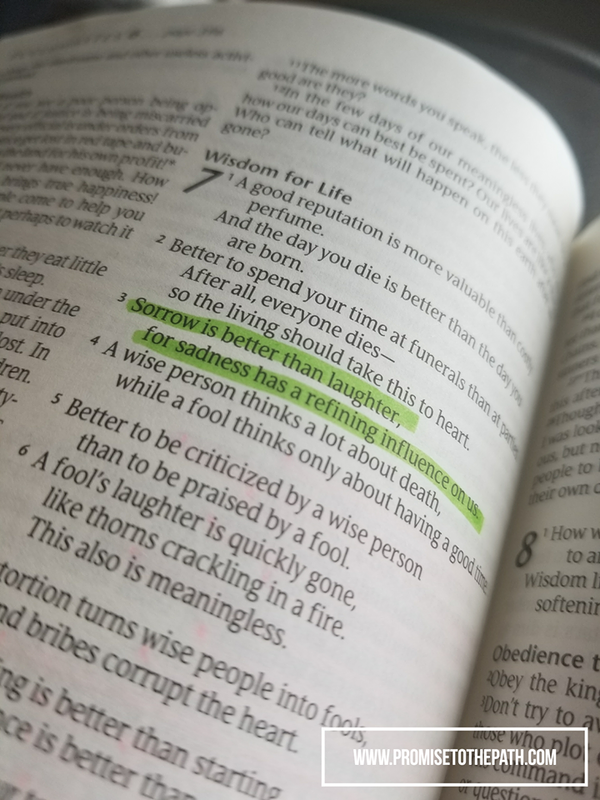 Ecclesiastes 7:3 - Sorrow is better than laughter, for sadness has a refining influence on us. There is sacrifice in praising Jesus. The sacrifice of praise requires that we trust in Jesus. One day, we will be in Heaven, in eternity, without pain, without heartache, without tears, without infertility, without exercising the sacrifice of praise. One day, we won't have to experience this sacrifice. We will be with Jesus - whole, complete, perfect. This sacrifice allows us to strengthen our relationship with our Creator. The sacrifice of praise, the sadness that requires faith to praise Jesus in the middle of our deepest hurts, it has a refining influence on us. It challenges us to be uncomfortable, and this is the avenue we grow best in. Sadness requires us to evaluate, to process, to lean into Jesus and hand Him our faith, and say "please, be good to me. Please, be kind. Please, take this cup from me. Please, allow Your will to be done". This verse isn't calling us to stay in our sadness, it's for us to give ourselves purpose in the middle of it. Someone once told me that if I am given the burden of righteous anger, it's because God wants to propel me to use it for His kingdom. If there is anything that lights a fire in my soul, it's seeing people hold onto their pain and refuse to allow any purpose to be molded from it. Doesn't it feel like such a waste? Sweet friend, there may be some pain you're holding onto - out of convenience or familiarity, or maybe you feel like you deserve to hold onto it. I want to encourage you to hold it before Jesus and ask Him what He wants done with it. Ask Him to help you. Praise Him in faith, knowing that He is working everything together for good for those who love Him and are called according to His purpose (Romans 8:28). I'm standing with you in this battle of bravery, asking God to mold my sadness, refine my heart, and to give me purpose to get through the next storm coming my way. Don't let the sadness consume you. Let it refine you. Allow it influence, not for wallowing, but for growth and change and the ability to fight the next battle. You're not alone in this.